Editor's note: This is Part 3 in a several part series where we dissect each offensive fantasy position and tell you what happened this season (2016) and how you can apply those lessons into your draft for next season (2017). Chris Ivory or T.J. Yeldon: Who should you draft? Can the Jags continue the 'Post-Wembley Wave' trend? Is WR-WR the way to go in fantasy redraft leagues these days? Is it time to fall in love with Lamar Miller? Mike Wallace Traded to Minnesota: How Does He Translate? Jimmy Graham Traded to the Seahawks: What Does it Mean for Each Team? Does strength of schedule really matter in fantasy football? Lessons learned: Are QB/WR combos a good idea? Want to make money playing Daily Fantasy Leagues? Sign up for DraftKings NBA Contest by clicking here. Alfred Morris in 2012. Eddie Lacy in 2013. Jeremy Hill in 2014. 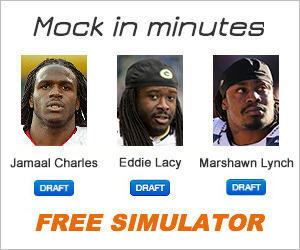 What do all three of those running backs have in common? Football isn't back, YET!!! But there is always time to prepare ahead for your draft. Especially since the exciting 2017 NFL Draft just passed. We already know who the top guys are for every position on every team. This article is for you to get a few names in your head. So, when your draft day comes you make the right decision scoop up these Bargain Bin players. Don't you love going into a store and find the clearance section or discounted items? It almost feels like you got away with stealing something. That is the best feeling in a draft as well when you get value late in drafts. The first installment focuses on the Running Back position just a few guys who will be available late in drafts that you probably should go get when you don't know who else to select. Never waste a pick!! Doug Martin- Despite being suspended for the 1st four games of the season, because he tested positive for Adderall. It's been an issue he has tried to get over and he now will seek the proper help to get over his addiction. Doug Martin will go under looked and forgotten about. This will be a great choice to scoop a lead back past the 10th round. Doug "Mighty Mouse" Martin has Charles Sims and Jacquizz Rodgers behind him, who will be competing for third-down work. They are no competition to a back they just gave a five-year contract to for $35 million. Derrick Henry - The days of Derrick Henry becoming a No. 1 are soon approaching. He's still behind DeMarco Murray but Murray isn't your typical pillar of health. The second DeMarco is out, Henry becomes a top 10 talent. At 6'3, 247 lbs. Henry is a battering ram in between the tackles and has the speed to get away from the secondary. This is the best handcuff in the NFL PLEASE TAKE NOTICE. Robert Kelly - Mr. Kelly burst onto the scene midway through 2016 season. He made a name for himself against the Green Bay Packers, with 24 carries, 137 yards, and 3 touchdowns. He wasn't quite able to duplicate that performance, any other game. On the bright side, he was consistently fed the ball 18 plus times a game 5 out of the last 9 games of the season. Kelly has Semaje Perine nipping at his heels but "Fat Rob" is still a worthwhile pick. Jamaal Charles - Many have given up on the former best RB in the NFL. Who hasn't been himself since 2014 campaign, where he averaged 5.0 yards per carry and 1,000 yards rushing. The now 30-year-old back has gotten a breath of fresh "Mile High Air". I think it was a great but risky signing by Denver who needs a running game to protect Trevor Siemian. Charles is being put in a great environment and succeed behind the struggling C.J. Anderson who lost his job briefly to Devontae Booker. Let's be serious Anderson runs hot & cold like a faucet so this is a great opportunity to seize the moment and get a possible steal of a pick. LeGarette Blount - Second only behind man-child David Johnson in rushing touchdowns, Blount had a resurgence with the New England Patriots. In any short yardage situation, LeGarette was fed and converted more often than not leading to 18 touchdowns. That's a hard stat to ignore when touchdowns are all we want from our fantasy players, especially someone you can grab in the last round of a draft. Joe Mixon - Cincinnati made this choice for a reason. There were rumors they wanted Leonard Fournette at pick nine. But once he was taken Mixon was clearly the next best talent to wait on. The Bengals organization is known for taking chances on troubled youth. Despite his off, the field actions cost him a first round selection and scared many teams away doesn't make him less of a beast on the gridiron. Mixon already steps in as a possible lead back by season's end. I strongly suggest you remember this name most importantly that will get forgotten in such a crowded backfield. More will unfold during the off-season and training camp that will lead to more Bargain Bin Backs. But for now, these are my favorites going into the 2017 NFL Season. A Defense can be one of the biggest conundrums in fantasy year in and year out. People tend to go with popular Defensive choices like the Seattle Seahawks or Carolina Panthers rather early in drafts. Just because it’s Round 10 doesn’t mean choose a defense. There are still valuable players and handcuffs to acquire during the latter rounds of a draft. Going by the finishing statistics of 2016, only one defense finished in the top five as their projection at the beginning of the season. According to ESPN Scoring, Denver Broncos D/ST had an average ADP of pick 67 which is asinine and only scored 152 points in 2016. That’s mid-fifth round in 12-team leagues and mid-sixth round in 10-team leagues. Let me ask you a question would you rather have Broncos Defense or future 2016-17 MVP Matt Ryan whose ADP was pick 114. Think smart on average defenses can score you 150 to 180 points in a good year depending on your league scoring. Every other position eclipses those numbers by mid-season. Kickers score more than Defenses do on average per year, and they get chosen as flier picks in the last round of every draft. Last season, the Atlanta Kicker Matt Bryant scored a whopping 212 points outscoring the highest Defense by 46 points, that’s astonishing for a position we thought was worthless. What I Learned in 2016. Wide Receiver Edition. The start of 2016’s fantasy football season was ushered in by countless twitter arguments over the validity of Zero RB. Week after week, our timelines would be cluttered with statistics in support or against the strategy, even worse, there were tons of unsubstantiated opinions on either side of the argument. While pure Zero RB didn’t filter into home league draft strategy, it is clear by looking at the first-round ADP that fantasy owners put an emphasis on drafting an elite WR. With five WRs in the Top-6 picks, 2016 was destined to be the year of the WR. WR4 DeAndre Hopkins was plagued by Brock Osweiler. WR5 A.J. Green was injured just late enough to completely wreck your season. WR2 Julio Jones only played 14 games, as he suffered an injury just in time for fantasy playoffs. But should we have seen this coming? The answer is yes. As you can see over the past 10 years, the mean finish of WRs in the Top-12 is seven players. But in 2015 there was the most extreme outlier year since 2007. With 11 players in the Top-12 in scoring, fantasy owners who went WR heavy were awarded at unusually high rates. This WR success bled into draft strategy and created a run on WRs from 1.01. How can we learn from this? Well, first, we can see that 2016 wasn’t exactly a down year for WRs. Antonio Brown, Jordy Nelson, Mike Evans, and Odell Beckham Jr were all drafted in the first two rounds. They may not have had historically great seasons but they were all valuable players. The six WRs that finished in the Top-12, were just a tick below the average number of WRs in the Top-12 in the past 10 years. I wouldn’t necessarily reinvent the wheel in terms of draft strategy. Opportunity is a bigger factor than talent in some cases. The 2016 season was a disaster for the tight end position. According to fantasyfootballcalculator.com Rob Gronkowski and Jordan Reed were the no. 1 and 2 tight ends taken in drafts. Gronk’s average draft position (ADP) was 2.02 and was taken as high as the 2nd overall pick. Injuries plagued him throughout the year and he finished as TE21 in standard scoring leagues. Reed was taken as the TE2 this season after being undrafted in 2015 but, as with Gronk, injuries limited his availability and he was just able to squeak in the top 10 TEs for the season. Drafting a tight end early is never a certainty even as we look to the 2015 season where Jimmy Graham was drafted as TE2 with an ADP of 3.08, but finished as TE17. The Top 3 tight ends for the 2016 season finished as 3 of the 6 TEs to eclipse the 100 target mark. Travis Kelce and Greg Olsen were the only tight ends to go over 1,000 yards for the year, on 85 and 80 receptions respectively. The knock on these players is the lack of touchdown production from a position usually known for scoring. In fact, 5 of the 6 previous seasons the TE1 has amassed at least 9 touchdowns, while Kelce and Olsen only combined to score 7. Gronkowski returning, Jimmy Graham becoming more involved in the Seattle offense and the random bursts of touchdowns from the Jack Doyles, Cameron Brates, and Hunter Henrys the tight end position is due for positive touchdown regression. In standard scoring leagues, 4 of the top 12 tight ends for 2016 were not drafted. Kyle Rudolph finished the season as TE3 and led all tight ends with 132 targets and finished third in receptions with 83. Rudolph was the perfect example of waiting for a tight end late and also having tremendous opportunity. In 8 of his 15 games played with Sam Bradford at quarterback, Rudolph posted at least one touchdown and only saw fewer than 5 targets 5 times. Rudolph posted a career high in targets, receptions, and yardage. Cameron Brate (TE6) and Hunter Henry (TE11) both finished with 8 touchdowns which led the position. Brate entered the season battling Austin Sefarian-Jenkins for the starting spot and after ASJ was released Brate was clearly the better option. 2016 was only his third season out of Harvard but he was able to compile 57 receptions on 81 targets. Henry was a rookie entering the season with a Hall of Fame predecessor, in Antonio Gates. While Gates served his suspension in weeks 2 and 3, Hunter Henry began his breakout posting 9 receptions and 133 receiving yards along with a touchdown. Antonio Gates announced he will be returning for the upcoming 2017 season, meaning Henry will fall in drafts and could be a late round flier or even possibly an early waiver addition to your team. To top all of the undrafted lists among tight ends however is Jack Doyle finishing as TE12. Dwayne Allen’s ADP was 12.06 so cutting ties with him was not painful, but after Coby Fleener left for New Orleans Allen seemed primed for a Top 12 season only to be out targeted by Doyle by 30 targets. Doyle is a free agent as we head into the off season, so this may be a one year outlier. What it does show however is, due to Allen’s injury history and concern the second tight end in Indianapolis will have value. , seasons his best game has come in the second -half of the year. The average draft position for Ertz has never been higher than TE11, yet he has yet to finish outside of the top 20 for TEs each year. Gates, as mentioned before, has an heir apparent looming over his shoulder. Even with the constant threat of Hunter Henry, Gates still managed to haul in at least 7 touchdowns for the 11th time in his illustrious career. Antonio Gates finished the season tied with Tony Gonzalez with 111 career touchdowns, and has stated he will be returning in 2017 to break the record. An ADP of 9.07 in 2016 bodes well for players looking to find a starting caliber tight end late in drafts. The player drafted latest of the trio was Jimmy Graham with an ADP of 11.04. Graham entered the season with huge injury questions, but throughout the season he proved he was back to being his normal self. As Seattle moves toward a more pass heavy approach with the questions in their backfield, look for Graham to become the touchdown machine he was in New Orleans. Only twice since 2011 has the tight end drafted first for the position finished as the no. 1 tight end on the year. Every year however there is a player that was either drafted late or not drafted at all who has finished at least in the top 5 for tight ends. It is best for fantasy rosters to stock up on skill position players in the earlier rounds and grab a tight end later in drafts, or even stream the position week to week. In conclusion, look for the tight end position to rebound from a bad 2016 season, but be prepared for names you weren't expecting to be lead the charge. Coming out of the 2015 season, the 2016 quarterback landscape was looking good. In 2015 all of the top 13 QBs threw for 30+ touchdowns and the top 6 all had over 300 fantasy points. In 2016 however, only five players threw 30+ touchdowns and only three QBs topped the 300 fantasy point bar. So, what did we learn about the quarterback position this fantasy season? Did anything go right or was this just simply a down year for quarterbacks? 2016 was the year that the general football consensus learned the importance of QB mechanics. Many quarterbacks have managed to skate by on arm talent alone and that makes them good fantasy options for one season. But inconsistent mechanics means inconsistent quarterback play and this means inconsistent fantasy production in the long run, explaining the huge drop off in quarterback production from 2015 to 2016. Brock Osweiler was at the helm of arguably the most talented offense in the NFL. Surrounded by DeAndre Hopkins, Lamar Miller and Will Fuller, Osweiler’s lethargic wind-up and sluggish release resulted in batted balls and many uncatchable targets due to his side-arm release. The same goes for Jacksonville’s Blake Bortles. The Jags offensive performance in 2015 garnered questions as to whether they were home to the best wide receiver tandem in the league in Allen Robinson and Allen Hurns. Bortles’ terrible 2016 mechanics resulted in Allen Robinson, a borderline 1st/2nd round pick in August, becoming effectively unusable this season as Bortles began to drop the ball below his elbow in his wind up leading to an unnecessarily long release and producing overthrown passes. Even last year’s MVP Cam Newton along with rookie prospect Carson Wentz had their mechanical flaws expose them this season. Relying on arm strength alone leads to inaccuracy and produces passes often too low for receivers to catch. Forced passes and backfoot throws are all traits of a quarterback’s reliance on their arm strength and often result in passes being too far behind receivers. Using your arm instead of your body is a quick recipe for an interception. Neither player steps into their throws and so they struggle to throw with touch and anticipation. Aaron Rodgers and Drew Brees on the other hand have perfect mechanics and it comes as no surprise that both of them are consistently top 5 fantasy quarterbacks, with the odd Super Bowl thrown in too. Momentum is a term we hear a lot regarding NFL offenses and it is often why fantasy owners worry when their players return from their bye-weeks as offense is all about practice, repetition and chemistry. Offenses that can keep their momentum going throughout the season are both NFL gold and fantasy gold. In 2015 we saw that a few offenses certainly were feeling their mojo and this lead to stellar quarterback play. Cam Newton, Blake Bortles and Carson Palmer were all part of high-flying offenses last year and all finished as top 5 fantasy quarterbacks. However, without relatively much changing, all three of those quarterbacks failed to repeat this in 2016, with Newton following his QB1 season finishing as the QB18 and Palmer slotting in right behind him. Strangely enough, the much maligned Blake Bortles finished as the best of the bad bunch with a confusing QB8 ranking. As we all accept Bortles is a fantasy anomaly year on year, the rankings clearly show that momentum doesn’t carry over through the offseason. With this in mind, beware of drafting the wildly inform quarterbacks from this season again in 2017. I’m looking at you Matt Ryan and Matthew Stafford. 2016 however, wasn’t all bad. With Peyton Manning retiring and Tom Brady and Drew Brees getting up there in years, 2016 saw the birth of the new crop of fantasy studs. Derek Carr (QB9), Marcus Mariota (QB15) and of course Dak Prescott (QB6) had a coming out party this year. Carr was an MVP candidate this season and probably would’ve finished as a top 5 QB without his injury in week 16. Mariota, who was also similarly injured to Carr in week 16, was complete gold-dust early in the season with three top 5 finishes in quick succession and threw for two or more touchdowns in two thirds of the games he played in in 2016. And we couldn’t discuss young quarterbacks without talking about the man of the moment, Dak Prescott. Prescott finished 2016 tied 5th for total touchdowns with 29 but the true measure of Prescott’s greatness this year has been in his ability to limit his interception total with only 4 INTs. Not only does that result in less negative points but it also keeps drives alive and results in more scoring opportunities for Prescott, who has also demonstrated legitimate rushing capability too. If 2016 has taught us anything, it is that you please, PLEASE wait on a quarterback when you draft next season. Unless you’re drafting Aaron Rodgers or Drew Brees, there is no need to take a quarterback in the first 6 rounds. Top RBs and WRs are so few and far between and with injuries too, the need to stockpile your skill position players is greater than ever before. Fantasy is usually uses only one quarterback per line-up and as quarterback is so deep there is no need to waste a high pick on a brand name quarterback. Instead take a RB/WR and wait for a sensible upside QB. For example, Ben Roethlisberger had a 6th round ADP and finished as the QB16 whereas Dak Prescott for instance had a 12th round ADP and finished as the QB6. It doesn’t stop there either; Kirk Cousins, Matthew Stafford and Derek Carr were all available in rounds 10-12 and all finished as top 10 QBs this season. But the craziest thing of all…Matt Ryan was undrafted this year in the majority of leagues. Wait and bet on upside, you might just wind up picking up the QB2 off the waiver wire.